I remodeled my kitchen and painted they cabinets grey. These purple knobs made the cabinets pop. I've had numerous friends ask where I got them! 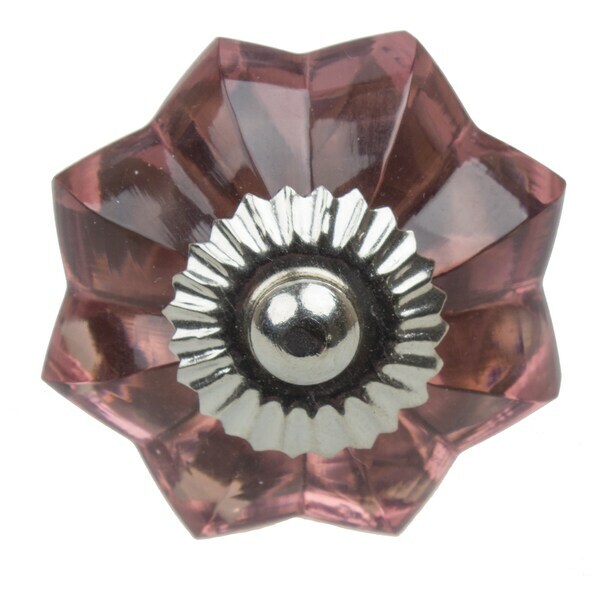 Add a unique look to your furniture or kitchen and bathroom cabinets with these beautiful vintage style flower shape glass cabinet knobs from GlideRite Hardware. Bring a personal touch to your home with these knobs which are handmade and polished to perfection, you can feel the difference the moment you hold the piece in your hand. The knobs include all necessary hardware to mount to your doors and drawers. The item as shown has 3 distinct pieces in front with 4 more behind the glass knob. There isn't a good way to tighten all the pieces together. The threaded stud runs front to back requiring t-nuts to be hammered into the back of your cabinet/ drawer face. Once installed the look is nice, sure glad we didn't have to drive 60+ miles to get the t-nuts though. My husband refinished an old,burled walnut dresser for a bedroom but the hardware was hideous. I chose these because the walls in room a a soft greyish lavender and so are these lovely knobs. Perfect! Arrived promptly, well packaged and nice quality.